Blockbook with manuscript text in German. Watermark: Triple mountain in circle. 288 x 207 mm. – 20 leaves, printed on both sides of the sheets, a total of 68 woodcuts (2 full-page) on 36 plates. First edition. Moreover, the only traceable complete copy of this edition and one of the earliest blockbooks extant. "Der Antichrist und die fünfzehn Zeichen vor dem Jüngsten Gericht" consists of a cycle of illustrations with explanations detailing the life of the Antichrist and describing the Last Judgement in the 'Fifteen Signs before Doomsday'. The Antichrist – here called Endkrist – is a false prophet, whose dubious miracles and untrue teachings form a negative parallel to the life of the Saviour. His defeat is followed by the Last Judgement, related in Die fünfzehn Zeichen, a self-contained treatise but one which was often combined with others, as in the present book. Soft lines and flowing draperies lend the woodcuts in the present work the impression of pen and ink drawings, the more so as corrections and additions have been added to the images by hand. The woodcuts do not show the angular, broken lines which are characteristic of most (later) blockbooks, they rather resemble the soft style as found in early German single-leaf woodcuts. 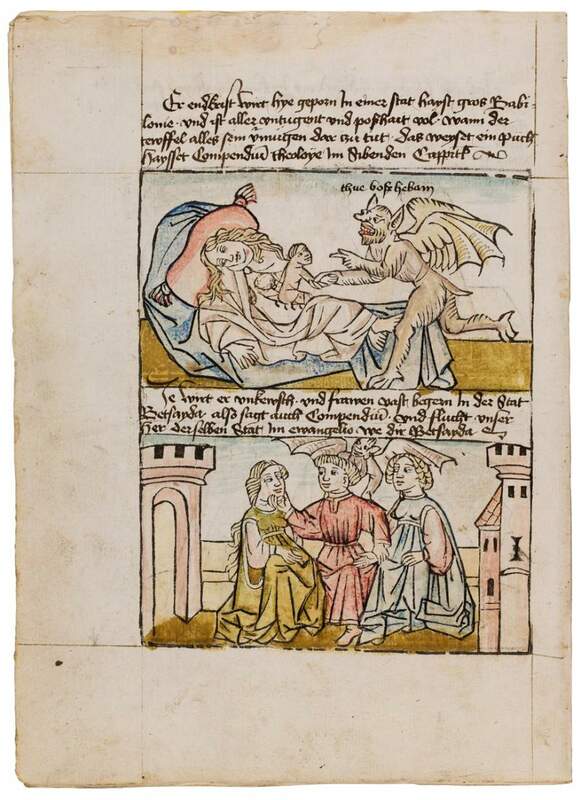 On stylistic grounds, this Antichrist edition originated in Franconia and is datable to the 1450s, which is also suggested by paper evidence and the fact that it was formerly bound together in Nuremberg – in its original binding – with a dated manuscript of 1456. Both their richly illustrated contents and their production technique lend a special appeal to blockbooks: illustration and text are cut into a wood panel, which is then printed onto paper using the rubber-printing technique. The combination of printed illustration with manuscript text in the present copy is a special form of blockbook, called chiroxylography, and dates rather to the beginning of the development of this technique. Medieval blockbooks are of outstanding interest to book collectors and librarians due to the high value resulting from their rarity. As only complete copy extant, this book is subject to the provisions dictated by the German Kulturgutschutz.